The National Retail Federation reported that in 2013, gift card spending reached an all-time high, with eight in ten shoppers purchasing gift cards totaling an average of $163. According to another study by the National Restaurant Association, six in ten Americans want a restaurant gift card as a holiday gift. Gift card printing is inexpensive and serves multiple marketing objectives, aiding in customer acquisition, improving brand recognition, and ultimately increasing sales. Gift card programs build revenue while reducing cash refunds and increasing in-store visits. Remember, it’s not just the gift card recipient that visits the retailer, but also the gift card purchaser. If you’re looking to build your email list, gift cards make a great incentive. They can also be used to drive social media interaction through contests and giveaways. For new brands in the marketplace, gift cards take on a viral effect, as brand advocates purchase and distribute gift cards to friends and family. 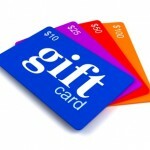 Plastek Cards offers a variety of gift card options, including various sizes, materials, finishes and designs. We also offer software and hardware solutions to enable gift card processing and reporting.